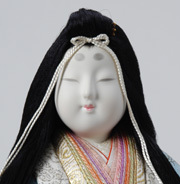 The Sadame (Japanese word for fate, destiny) doll is modeled after the Moon Princess of the famous Japanese tale, which is known as the oldest written novel. 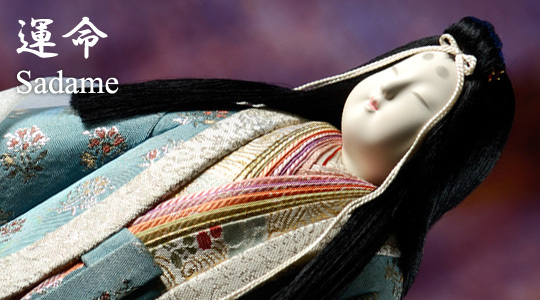 This doll represents the scene that the princess goes back to Moon. 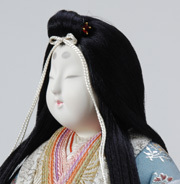 The face of the doll shows the sorrow of the princess. 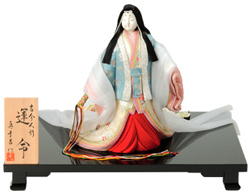 The oldest story in Japan. Once upon a time, an old man found a baby girl in bamboo. 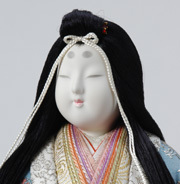 He named this girl Kaguya princess and cherished her. She grew to a very beautiful woman. Even the Emperor asked her to marry. Someday she started to cry. She never told the reason why that she was crying at the beginning, but when the old man asked, she said that she came from another world had to go back there soon. The old man and the Emperor tried to hold her back, but angels came down from the Moon and they took the princess to there. Although the princess did not want to go back, angels made her to lose her memory and changed her mind. After the princess went back to the Moon, the old man and his wife laid up with illness and sorrow, and the Emperor lose his will to live.